« “In the unlikely case of a landing on water…”! I’ve been wondering about celery soup lately. I always enjoyed the taste and crunch of raw celery–( it felt like taking a bite of good health!). It often featured on a plate of cheese at home in the fifties–cutting nicely the richness of a slice of cheddar and cleansing the palate. Raw fennel serves the same purpose. In cooking, celery is usually a supporting player–there to help add flavour and depth to soups and stews; though a dish of braised celery topped with a grating of parmesan makes for a tasty vegetarian main course–I might try it later in the week. 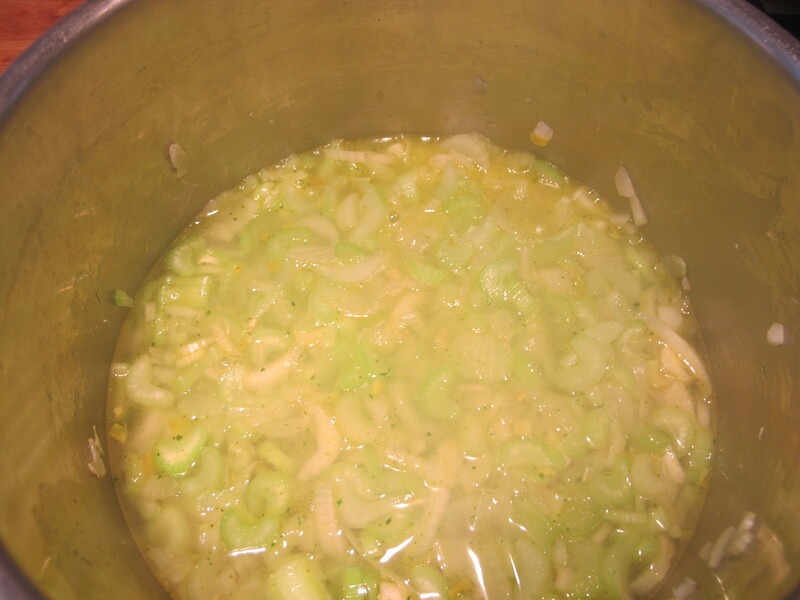 I’ve never made celery soup though–until this week. How well would it work without the usual addition of potato to thicken it? Other vegetables? I tried a leek and red onion–then settled for just a medium ordinary onion. What to add to it for flavour? I tried a couple of things–cider vinegar, yogurt with cumin–then settled for white pepper and nutmeg. 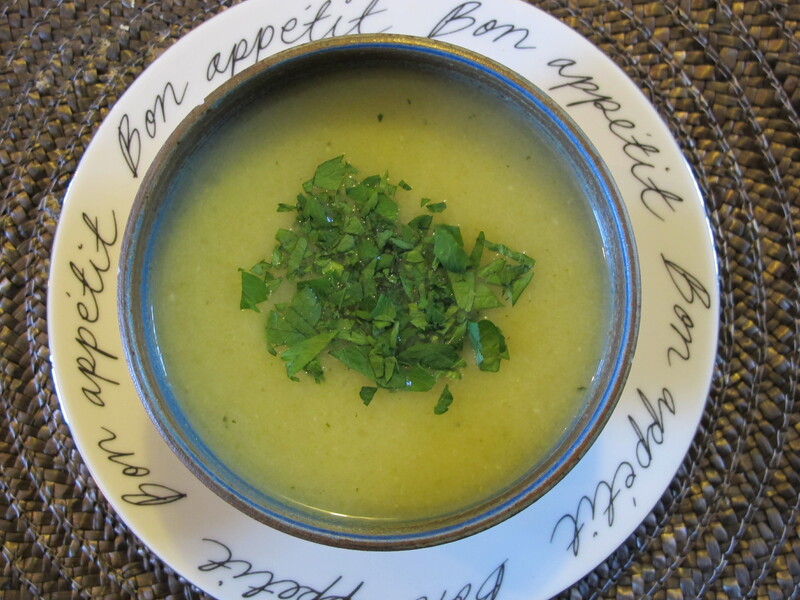 This is the simplest of celery soups! 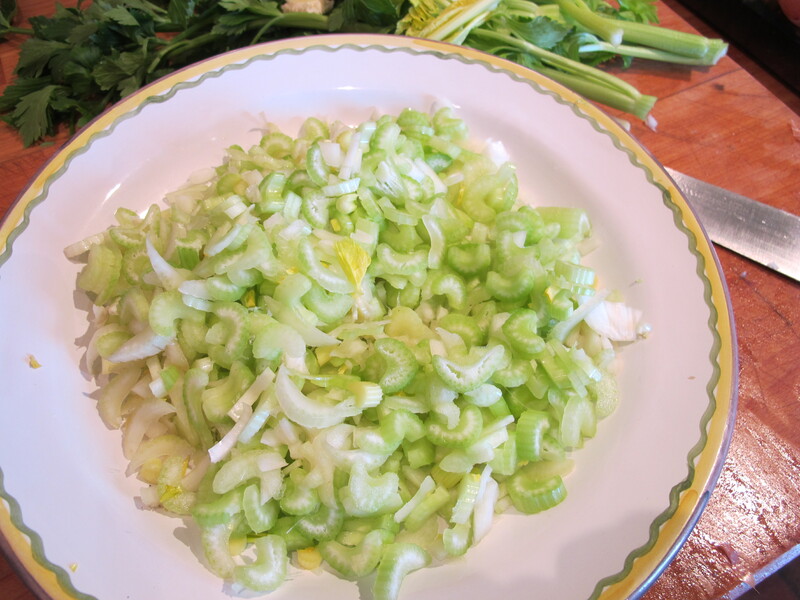 Add the chopped celery, onion and garlic. Turn them all thoroughly in the oil. Sweat (don’t brown) these gently for about five minutes–to soften them. Add the stock and continue cooking uncovered until the vegetables are tender–about 15 minutes. Liquidize the soup (a handheld stick liquidiser saves a lot of washing up!). Stir in the nutmeg and season with salt and white pepper. Right, local store here I come, time for celery in my tum. This is how the intro to the book begins…! This book is written for people who love food, enjoy cooking and wish to continue those pleasures despite a diagnosis of Type 2 diabetes. It is also for those people who love them – because the Mediterranean way of eating is healthy for everyone. Hope the store has it! I am very fond of celary,I always use it in stews, but most of all after a meal with some stilton cheese and a glass of port – lovely. I confess that I have not tried to make soup, but I will. P.S. thanks for the ginger tea post, for the past week or more I have had a stinker of a cold my throat has been like razor blades, yesterday I bought some fresh ginger and made the tea,my throat feels so much better and so do I. Thank you Dr’s Ellis both. I’ll try it on my grandkids, they love celery. I cannot wait to try this recipe. I love celery and always keeps some in the fridge for snacking and soups. I’ve always wanted to do something more with it. Thank you once again!! Hi Robin. Based on a recipe from Lindsay Bareham’s “A Celebration of Soup”, I add a little celery seed which adds beautifully to the flavour. If you do not have this book in your own collection it is one well worth acquiring. Talking of cookbooks, I recent addition to my own burgeoning collection was a signed copy of “Delicious Dishes for Diabetics” . A present from a mutual friend Sonia – that generous supplier of all things edible from her productive jardin potager. When we are not relaxing in the Tarn enjoying all the wonderful things it has to offer, our working lives are spent here in Ireland. I only mention this as, just after returning from a relaxing prolonged break and feeling a little down at the prospect of launching into a mountain of work, it was a pleasant surprise to hear you being interviewed about your cookbook on the Pat Kenny show on RTE radio. Regards. Steven and Anne Marie.